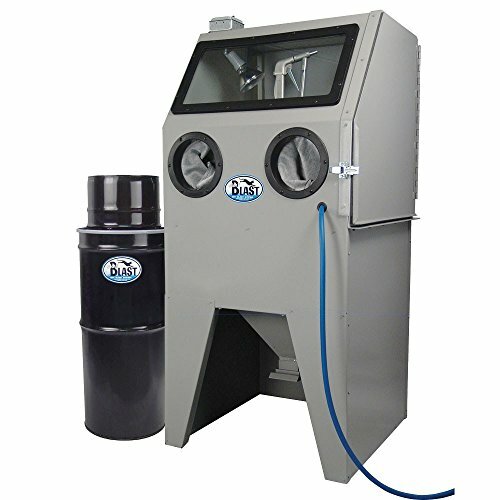 USA-2828 is a perfect fit for tight garages or small shops ... Trigger-Operated gun offers great control and Vac-50 HEPA Vacuum helps provide good visibility while blasting. Expanded metal screen holds up to 200 lb objects easily, and welded angle-iron door frame provides added strength. Abrasive continually recycles from bottom hopper onto workpiece, so you don't have to stop to reload. Why chance lost or damaged parts? You can have full control of your parts and pay for your cabinet on the very first restoration! Easy to use: insert part through side-loading door and pull trigger. S-35 Trigger-Operated Power Gun removes rust, paint, and scale to bare metal FAST! 28" wide work area accommodates headlights, taillights, fuel pumps, carburetors, manifolds, interior and under-the-hood parts, wheels, air cleaners, springs, hinges, pistons, valves, cylinder heads, and more! Can also be used to etch glass or blast designs in wood. USA 2828 Skat Blast Cabinet Includes: Powerful Vac-50 HEPA Vacuum to remove dust as you blast • S-35 Trigger-Operated Power Gun with 7 ft air hose • 3 steel nozzles • 28" long double-strength cabinet gloves • Tempered glass lens, 12" x 24" x 3/16" with peel-off inner lens protector • Molded glove and lens trim - prevents leaks • 50 lbs fast-cutting Skat Magic Abrasive • Automatic abrasive recycling system • Right-hand side-loading door, full-size 11 gauge steel with welded angle-iron framework • Strong 11-22 gauge USA steel construction • Expanded metal screen holds objects up to 200 lbs • Adjustable 90 watt floodlight assembly • Quick-change trap door for fast abrasive changes • Replacement parts IN STOCK! Ships TRUCK MOTOR FREIGHT - US-48 STATES. Ship wt 315 lbs (see shipping info for details). Liftgate available at extra cost. 28"w, 28"d, 28"h work area! Overall cabinet size: 30"w, 30"d, 64-1/2"h. FULLY ASSEMBLED! Strong 11-22 gauge USA steel construction: 11 gauge steel door with welded angle-iron framework, 22 gauge steel body. Requires 10-15 cfm @ 80 psi. 125 psi max. 5-Year Limited Warranty. Made in USA! IN STOCK! If you have any questions about this product by Skat Blast, contact us by completing and submitting the form below. If you are looking for a specif part number, please include it with your message.